Omega-3 and omega-6 fatty acids are essential fatty acids (EFAs) important inhuman nutrition. The biological function of these fatty acids is to control blood clothing, inflammation, anti-inflammation, and to form cell membranes that are fluid. Omega-3 and omega-6 fatty give rise to different types of signals that balance and counteract each other. For every signal molecule with specific function there is another signal with the opposite action. Often a signal molecule derived from the n-3 series of fatty acids will an antagonistic signal derived from the n-6 series of fatty acids. If there is too much of one particular family of fatty acids the balance is disturbed, resulting in a variety of diseases. Because omega-3 and omega-6 fatty acids cannot be synthesized in the body, they need to be ingested. Dietary imbalance in the omega-3 to omega-6 ratio will severely upset normal control functions, resulting in a variety of malfunctions. Modern society diets are imbalanced, and there is a severe shortage of omega-3 fatty acids. Their health benefits of omega-3 fatty acids have been the focus of much research in the past two decades. The biological roles of these molecules were brought to the notice of the scientific community by the observation of low rates of coronary heart disease (CHD) among the populations of Japan and Greenland, where fish is an important component of the diet. Many subsequent studies have shown the benefits of dietary consumption of omega-3 FAs in cardiovascular disease, dyslipidaemia, atherosclerosis, hypertension, diabetes mellitus, metabolic syndrome, vascular re-activity, obesity, inflammatory diseases, neurological/neuropsychiatric disorders, renal disease, osteoporosis, eye diseases and pregnancy. With greater focus on chronic disease prevention globally, the role of omega-3 FAs in human health has become an area of interest for clinicians and the general public. Omega-3 fatty acids are generally supplied as oils. CLS Technology has identified a new class of omega-3 products (third generation omega-3 products, that are soluble in water as well as in oils. A value chain from raw material to finished product for the use in has also been established. The company has proprietary knowledge of the product and product applications that are in process of being patented. US health officials have claimed that the introduction of omega-3 on the american market has had a bigger effect on the public health than the combined medical industry. 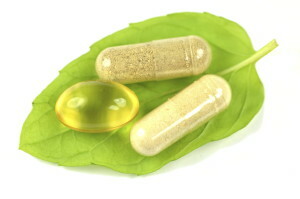 The health effect is explained by omega-3 products patching up a problem that unintentionally has been introduced by the food industry: To improve the stability of food the ingredient industry has developed a process (partial hydrogenation) that transforms the unstable omega-3 fatty acids into the more stable omega-6 fatty acids. This process has significantly disturbed the balance between the pro-inflammatory omega-6 fatty acids and the anti-inflammatory omega-3 fatty acids. The consequence is stable food at the expense of impaired health. Pharmaceutical companies have mended this problem by introducing drugs (COX-2-inhibitors like Celebrex and Celebra) that inhibit the effects of excessive amounts of omega-6 fatty acids. However, the real solution to the problem is to restore the omega-3/omega-6 balance. There is a strong drive in society to fix the problem, partly because the economic consequences of a malnourished population are gigantic. The long-chain omega-3 polyunsaturated fatty acids DHA and EPA are popularly called omega-3. supplementary intake of omega-3 is recommended in the western world, due to generally low dietary intake and omega-3’s health promoting benefits. Benefits attributed to omega-3 include reduced risk and improved treatment outcomes regarding cardiovascular disease and inflammatory joint diseases. Better brain and central nervous system development, improved cognitive functioning, and improved skin health are additional benefits. Research indicates that even more omega-3 benefits for individuals will be identified and that greater intake can lead to better general health in western, industrialized cultures. The quality of the omega 3 phospholipid is directly linked to the amount of omega-3 fatty acids they carry, in particular DHA. DHA eggs, which are produced by force-feeding hens with fish oils, contains less than 5% DHA (22:6 w3), while fish roe contains more than 30% DHA. Krill oil contains up to 15% DHA.Omega-3 triglyceride vs. phospholipid Omega-3 fatty acids can be supplied either at an omega-3 triglyceride or as an omega-3 phospholipid. Omega-3 phospholipids are soluble in water, and do not need bile salts for digestion. They spontaneously form micelles that can be acted upon by digestive enzymes. Their simpler digestion process in the small intestine before absorption is one of the factors indicating that omega-3 phospholipids offer greater bio-availability in the human body than omega-3 triglycerides. Another suggested factor is that phospholipids are directly absorbed by intestinal epithelia for distribution via blood plasma; considerable triglyceride transport involves facilitation by the lymphatic system. Absorbed in different ways Triglycerides and phospholipids are digested and absorbed in different ways in the small intestine. Omega-3 phospholipids follow simpler digestion and distribution routes than omega-3 triglycerides in the human body. Greater bioavailability and inefficiency of omega-3 phospholipids relative to omega-3 triglycerides influence cellular absorption, functioning and distribution of omega-3. Normal development of the mammalian brain and eye depends on adequate accumulation a long chain n-3 polyunsaturated fatty acid with six methylene-interrupted double bonds – docosahexaenoate (DHA) – in the membranes of those organs. Exactly what DHA does is not fully understood but it cannot be replaced by any other molecule, even very similar fatty acids with five double bonds (Crawford et al, 1999). DHA has traditionally been viewed as not technically being ‘essential’ in the diet because it can be synthesized endogenously; the pathway exists in all mammals studied to date. The critical point is that the capacity to synthesize DHA in human infants appears from recent studies to be insufficient to provide the amounts of DHA needed for normal brain accumulation of DHA or for normal brain and visual development. Hence, DHA is becoming accepted as conditionally essential, at least for neonates, a concept already well established in nutrition. Omega3MPLTM is a omega-3 phospholipid that contains more than twice as much DHA as Krill oil, and is the richest natural DHA-product available. There is a big nutrition gap in the population. For example the current DHA plus EPA (combined) daily intakes (USA) range from 130-150 mg/day. The American Heart Association has recommended a daily intake of 900 mg/day since this amount has been shown to be beneficial in affecting coronary heart disease mortality rates in patients with coronary disease. Likewise, studies of cognitive function of children have demonstrated a link between the DHA level in infant formulas and their mental development. It is recommended that 0,35% by weight of the total fat (fatty acids) should be present as DHA. In North America/Canada the average value of DHA in breast milk is only 0,14%, far below the recommended value. The low level of DHA in breast milk is due to the very low intakes of DHA during lactation (approximately 80 mg/day) in North America. It is recommended that the daily target for minimal DHA intakes during pregnancy, including the last trimester wherein DHA is very actively deposited in the brain membrane phospholipids, should be 300 mg DHA/day. The actual intake is thus far below the suggested intake. It is recognized that this problem has to be dealt with: The cost of preventing diseases is much lower than the cost of treating disease. Therefore there is a strong drive (both from individuals and societies) towards food or food supplements with a proven nutritional effect (nutraceuticals). The solution to the problem is to modify production techniques so that the omega-3 level of the raw material is maintained and the omega-6 level is reduced, and to offer food supplements that restore the ω-6/omega-3 ratio. Documented effects of omega-3 fatty acids include: cancer prevention, cardiovascular disease prevention, stimulation of immune function, anti-inflammatory action, and improved brain health. 1 US Health Officials estimate that there is a nutrition gap of 100-200 mg DHA/person/day in the US population. Thus, there might be a need for DHA dietary supplements on a scale of 350.000 tons/year. The present world market is about 35.000 tons/year. DHA is of fundamental importance in all age groups. DHA has recently gained attention as a supplement for pregnant women, noting improved attention and visual acuity in newborn babies. Low levels of DHA are associated with poor retinal development, low visual acuity, and poor cognitive development. A working group from the ISSFAL (International Society for the Study of Fatty Acids and Lipids) recommended 300 mg/day of DHA for pregnant and lactating women. The average consumption is much less.Cognitive decline and dementia On the other end of the age scale we note the effects of DHA on cognitive decline and dementia. Accelerated cognitive decline and mild cognitive impairment correlate with lowered tissue levels of DHA/EPA, and supplementation has improved cognitive function. Huntington disease has responded to EPA. Omega-3 phospholipids supplements that combine DHA/EPA and phospholipids into the same molecule have shown marked promise in early clinical trials. Potent immunomodulatory effects It is well documented that these fatty acids have health benefits. In cell culture and animal studies, omega-3 fatty acids have potent immunomodulatory effects that appear to be mediated both through modulation of eicosanoid synthesis and through an eicosanoidindependent inhibitory effect on the proinflammatory cytokine interleukin 1 (IL-1). The excessive loss of body weight, mostly combined with loss of appetite, is a problem that often occurs with advanced metastatic cancer disease. More than 80% of patients with advanced cancer suffer from the cachexia syndrome which not only impairs quality of life but also increases therapeutic complications and implies a poor prognosis. Recently it has been documented that isolated from caviar roe is a promising new dietary approach to tumor associated weight loss. omega3MPL™ was used as a nutritional supplement to patients who suffered from various tumors in metastatic stage and weight loss. Thirty-one patients (16 women, 15 men) were included in the investigation, which lasted for 6 weeks. Each patient received 500 mg of omega3MPL™ capsules three times a day. Patients were examined at three time points: before intervention, after 3 and after 6 weeks. Examination included blood sampling for routine analysis and determination of lyso-PC and fatty acid profiles in plasma phospholipids as well as red blood cells (RBC) and mononuclear lymphocytes (MNL), physical exam, bioelectrical impedance analysis (BIA), and completion of a quality of life questionnaire. In this study, omega3MPL™ was used. The high percentage of phospholipids on one hand should reduce side effects like fishy taste or smell or indigestion because of the natural detergent effect of phospholipid molecules. Furthermore, the uptake and metabolism of the n−3 fatty acids bound to phospholipids differs from those bound to triacylglycerol. The intake of MPL capsules over a period of 6 weeks induced a significant change in the fatty acid profiles of blood cells and plasma PL regarding the PUFA (AA, EPA, DHA) content. While the percentage of AA decreased only slightly in plasma PL and MNL, a significant decrease (p=0.037) could be observed in the RBC. The increase of the omega-3 fatty acids EPA and DHA in plasma PL and MNL was impressively high, while the increase is less in red blood cells. The omega3MPL™formulation used in this dietary intervention trial with cancer patients suffering from cachexia was highly accepted by the participating patients. The overall results showed a consistent trend toward improved quality of life, improved physical strength without concomitant increase of mean lean body mass. The weight loss was stabilized. In conclusion, dosage of 1.5 g/day omega3MPL™was a highly accepted and a compliant formulation of marine fatty acids. The low-dose supplementation induced a significant change in fatty acid profile profiles in plasma hospholipids, red blood cells and mononuclear leucocytes. omega3MPL™ significantly reduce body fat and plasma lipid levels This trial studied the effect on feeding mouse with animal proteins (Feed 1) in order to create a condition of obesity. Then the mice were given a feed where parts of the animal proteins were substituted with fish proteins (omega3MPL™ – Caviar Protein Powder) from Herring roe (Feed 2). The mice fed on this new formula lost some weight, but this was not significantly. 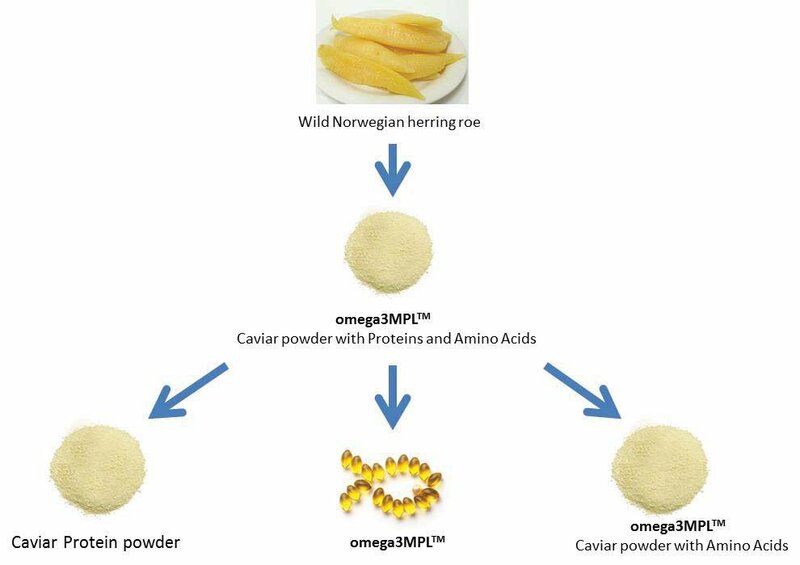 At the end the mice were fed with Feed 1 where 5% of the animal based proteins were replaced with omega3MPLT™ – Caviar Powder with Amino Acid). A significantly dietary effects of omega3MPL™ – Caviar with Amino Acid on plasma lipids and abdominal fat pad weight were observed. The main lipid class of HR-L was phospholipids (74%) and the main fatty acids were palmitic acid (16:0, 25.8%), DHA (22:6n-3, 21.6%), EPA (20:5n-3, 14.4%), and oleic acid (18:1n-9, 13.2%). A little increase in total cholesterol level was observed in plasma lipids of mouse fed with HR-L, although HR-L contained 9% cholesterol. This would be due to the lowering effect of EPA and DHA contained in HR-L on plasma cholesterol. Replacement of a part of dietary protein (5%) to HR-P reduced abdominal fat pad weight, but not significantly. On the other hand, combination of HR-P and HR-L significantly reduced the fat pad weight of the mouse as compared with the control. A significant effect of HR-P + HR-L was also observed in the reducing plasma lipid levels. omega3MPL™ and brain Specific studies have concerned the effect of dietary Phospholipids (PL) on the brain functions. Kidd (1999) showed that PC improved memory and learning performances in ageing human. In the same order, Bernoud et al. (1999) proposed Lyso-PC as the most efficient carrier of DHA to specific brain tissues. Brain preferentially absorbs DHA as sn-2 Lyso-PC compared with unesterified DHA. On the contrary, PS appeared to be concentrated in the cell zembranes of the brain. A comparison between Triglycerides (TAG) and PL-fed groups indicated that only PL supplementation increased brain DHA, as established by Werner et al., 2004. PLPC omega3 PUFA bioavailability: preliminary results on Caco-2 cells. PL are 50 times more bioavailable than TAG The question is: Is there any interest to use PL as vectors for PUFA rather than TAG? The particular interest of marine PL (MPL) consists in a high degree of unsaturation, with ARA, EPA and DHA mainly esterified at the sn-2 position. Consequently, their intestinal absorption is high according to Bourre, 2004. This property has been confirmed by using a Caco-2 cells assay. The permeability of the PUFA on PL was found 5 times higher and the final intracellular level 50 times higher than PUFA on TAG. Wijendran et al. (2002) have shown that the efficacy of PUFA supplementation was higher by using Phospholipids instead of TAG as established in a dose-response study. These benefits could be due to the amphiphilic properties of the phospholipids reflected in a better water dispersibility and a greater susceptibility to phospholipases compared to the glycerolysis of TAG. Several studies have concerned the brain function: 1. A supplementation of DHA on PL improves behaviour, learning and visual functions in x3-deficient mice, as demonstrated by Carrie et al., 2002. Moreover, in mice with PUFA deficiency, Bourre et al., 2002 showed that a PUFA on phospholipids supplementation was more efficient than a TAG form to recover a normal AG composition in brain. 2. A particular PL, phosphatidylcholine (PC), has been proposed to be a specific AG carrier to the brain by Lagarde et al., 2001. Other effects related to ageing have been investigated: Rotstein et al. (1987) have observed that DHA-rich PL decreased in the retina during ageing, as well as the turnover of the PL in the synaptic membranes decreased. Bourre (1992) established that the efficacy of some hepatic desaturases decreased during ageing, this making worse the DHA potential deficiency. Regarding brain diseases, PL have been found to have a beneficial effect in dementia, depression, and other diseases. Moreover, PL has been supposed to improve some brain functions like memory. However, all these global effects are still controversial, even though this has been claimed by some nutraceuticals for years. Comparison of omega3MPL™ from CLS Technology with the leading krill. The figures demonstrate that omega3MPL™ have 2,5 times more MPL but close to 3 time more DHA-MPL. This means that the daily recommended dose can be reduced significantly. Also, we expect that the nutrition gaps of pregnant/lactating women, can be filled by ingestion of 2 capsules of omega3MPL™ per day. omega3MPL™ has a compositional stability. The reason for this is that the biosyntheses of roe is under genetic control, therefore only minor variations in the MPL composition. The resource for omega3MPL™ is sustainable. Traditional fisheries generate huge amounts of by-products, including roe that is not exploited. originating from a resource classified as food. Hence omega3MPL™ is not under “novel-food” restrictions. omega3MPL™ is “green”. We do not use resources that are important inputs in higher tropic levels in the marine food web. Our production process is carried out by subcontractors. We have freedom to adjust to new “state of the art” production technologies without investing capital in processing equipment. Our production line is flexible. Our product has an excellent Cost/Benefit ratio. Comparison with Krill oil Comparison of CLS Technology caviar MPL with Krill oil. The figures above demonstrate that the products have approximately equivalent contents of MPL (30% and 35% of total lipid). The content of DHA in CLS Technology caviar MPL is twice as high as in Krill oil, meaning that the daily dose can be reduced with 50%. One 500 mg capsule of CLS Technology caviar MPL contains 30 mg DHA. We expect that the nutrition gaps of pregnant/lactating women can be filled by ingestion of 2 capsules of CLS Technology caviar MPL per day. high bioavailability MPL is a significantly better transporter of DHA than triglycerides, in particular to the brain. This property is believed to bring substantially more value into the product, and will therefore justify a considerable higher price for the product compared with traditional (second generation) omega-3 products. In addition we will offer a unique patent protected combination product specifically aimed towards the “brain health” segment. CLS Technology is in process of doing this, and cannot inform more about this before the patent is filed. However, this combination product will have a potential as a drug in the Pharmaceutical market. The word “bioavailability” signifies the speed a substance (drug of nutraceutical) is taken up, and made available, at a place in the body where it has a physiological or biochemical activity. This definition includes the fact that a specific compound can have different bioavailability in different organs. Some organs, like the brain, are protected by a specific barrier that only allows transport of a small selection of compounds. This means that most compounds do not enter, while other freely can pass the blood/brain barrier. Phospholipids, or more specifically lyso-hospholipids, belong to the small selection of compounds that has free passage over the blood/brain barrier.